Saturdays and Sundays at 10 a.m. and 2 p.m. Admission is free, thanks to the generous support of The Helis Foundation, with bicycles provided by Blue Bikes. 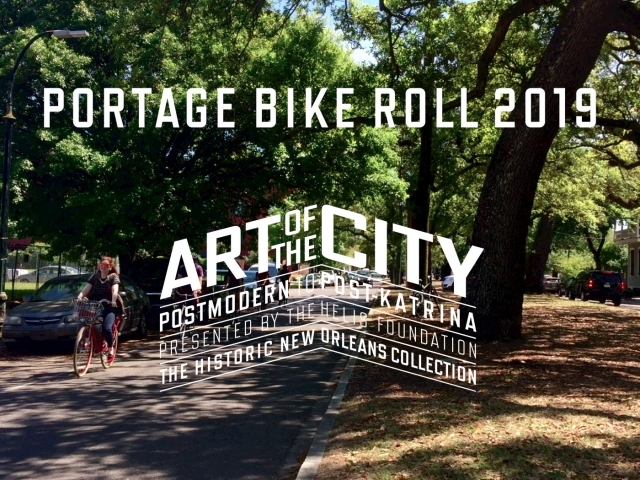 The Historic New Orleans Collection will reprise its popular Portage Bike Roll in 2019 and once again bring participants face to face with the culture of New Orleans. A component of the upcoming exhibition Art of the City: Postmodern to Post-Katrina, presented by The Helis Foundation, the Portage Roll is a bike tour that can be taken with or without a guide and will reach outside of the gallery walls to bring participants face to face with the art, architecture, and history of the city. Featuring stops at St. Augustine Church in Tremé, The Wave of the World sculpture in City Park, Bayou St. John, and more, the Portage Roll intertwines these landmarks of New Orleans’s diverse communities into a single, idiosyncratic urban landscape. The six-mile tour traces the ancient portage route—an overland path—that once connected the Mississippi River to Bayou St. John and, by extension, Lake Pontchartrain and the Gulf of Mexico. Situated on a natural ridge, this footpath had been used for trade by Native Americans for centuries, and prompted the French to establish New Orleans in 1718 where the French Quarter is today. Esplanade Avenue, running from the river to Bayou St. John, traverses part of this ridge and is the primary thoroughfare of the Portage Roll. Artist Babette Beaullieu set the route, which was inspired by a similar program conceived by the late architect R. Allen Eskew. Jacob Rozensweig, a local cartographer, designed a map of the tour, allowing for a self-guided experience. Guided bike tours will be held on Saturdays and Sundays, May 11–June 2, at 10 a.m. and 2 p.m., and are free, thanks to the generous support of The Helis Foundation. Bicycles will be provided by Blue Bikes. Reservations are required and may be made through my.hnoc.org. Participants must be 16+ years old. Art of the City will open on April 6, 2019, as the inaugural exhibition in THNOC’s new, exhibition center at 520 Royal Street. Programming related to the exhibition will continue throughout the run of the show, and Portage Roll maps will be available in the exhibition. Note: The guided tour travels more than six miles and requires strenuous physical exertion.